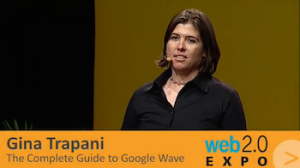 O’Reilly has posted the video of my 15-minute keynote speech at Web 2.0 Expo this week, entitled “Making Sense of Google Wave.” There were over 2,000 people seated in the audience, and I was nervous. I wanted to communicate my enthusiasm about Wave but also get across that it’s an power tool for power users, with a learning curve. Take a gander at the video. See also Andrew LaVallee’s impressions of the talk in his WSJ blog post, Google Wave (Not) For Dummies. You can see all the Web 2.0 Expo talks on YouTube as well here. You were nervous indeed 🙂 but it was a great speech, very informed & informative. Congratulations! Thank you for the great speech about Wave and even better book that you put online. Aww, that’s so cute. You are sooooooo nervous! Great job, on the speech, on the book, and on earning your new title, the ‘Herald of Google Wave’. It’s a great speech, congratulations. Recently I began reading your new book and I just loved it. It has helped me figure out what I could do with my google wave invite. As soon as some of my friends get their invites I’ll try to use it as a collaboration tool, like your video says, for homeworks and college stuff. Also in this day and age, it is stronger to avoid using the word “amazing”. It’s a big fad now and it is becoming meaningless. Banning “amazing” is an excellent idea. I’m on board! I won’t argue with dropping overuse of “amazing” as a goal in formal writing/speaking/etc. (overusing any adjective is a no-no and kind of boring); I will argue until I’m dead with people complaining with how other people use words, à la http://www.banamazing.com/. We’re not slaves to words. Words mean whatever meaning people give to them, and that meaning comes through their use. It’s part of how some words’ meanings eventually become archaic, right? It’s one thing to get upset about people out-and-out incorrectly a word, particularly when it’s a misuse that’s not shared with any sort of critical mass of speakers, but when everyone’s using a word in a way that you feel dilutes the word’s meaning, deal with it. Maybe that word’s changing a little. For better or worse (better), language ain’t static.